Jean Colbert (Wessel) Love was born January 15, 1932 in Oklahoma City. She entered eternity with Jesus, our Lord, peacefully and with a smile on her face. Jean is the daughter of Kennis N. and Lillian Louise (Colbert) Wessel. Jean graduated from Old Classen High School in 1950 and went on to Oklahoma A&M. Jean married Howard J. Vanhook, Jr. in 1950 and they had four children. 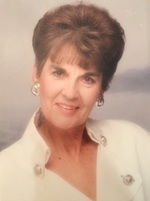 Jean’s family will always fondly remember her quick-witted humor, bold fashion, love of her Chickasaw heritage, resilient qualities and her love of laughter. She was preceded in death by her parents, her step-mother, Mrs. Kennis (Anne) Wessel; and her husband, John A. “Jack” Love. She is survived by her children Kim Fergason, Kent Vanhook, Karol Tapscott, Karla Severin, and their spouses; her brother Kenn Wessel, her sister Sharon Martin and their spouses; her grandchildren Gene Fisher, Kelli Basinger, J.C. Hartpence, Justin Hartpence, Tyler Fergason, Julie Winfrey, Wes Batson, Taylor McKinnon, Anthony Severin; and her 16 great grandchildren. In lieu of flowers, donations may be made to Good Shepherd Hospice, 4350 Will Rogers Parkway, Suite 400 Oklahoma City, OK 73108 (goodshepherdhospice.com) . Her Celebration of Life Service will be held Friday, May 4, 2018 at 2:00 p.m. Visitation will precede the service beginning at Noon. Both visitation and service will be at Crossings Community Church Chapel, OKC. To send flowers to the family of Jean Colbert (Wessel) Love, please visit our Heartfelt Sympathies Store.